August 24th 2018, Milton Keynes, UK – Since the last token offering conducted by Blockchain gaming platform TriForce Tokens, the team has been extremely busy working its MVPs (Minimal Viable Products) in order to create utilization of its FORCE cryptocurrency. Due to the forever evolving, and arguably unforgiving crypto space, TriForce Tokens has evolved itself into a games publishing framework. These changes have allowed the company to stay ahead of its competition and ensure that it provides real-world use cases for blockchain technology. With the upcoming final public token offering scheduled for 8th October, TriForce Tokens is positioning itself to become a games publishing framework, amongst its other MVPs which are designed to complement one another. In order to deliver on this vision, the team has made the decision to start work on their own blockchain. Through developing their own blockchain, TriForce Tokens will remove transaction fees and create a blockchain that serves the games industry. More on this will be announced in their latest documents which will be released on 31st August. The company is also announcing a final private token offering on 3rd September which will be restricted to raising the initial $3m soft cap, with $460,000 already secured toward the goal. Accredited private investors are encouraged to contact the team directly should they have an interest in joining. The Dynamic Advertising Platform is the newest MVP in the ‘TriForce Tokens’ arsenal. 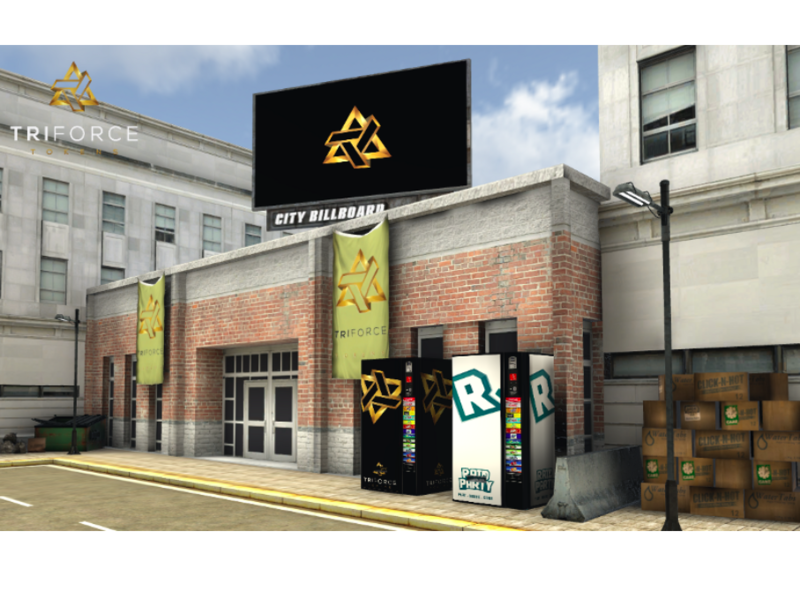 The platform allows for non-intrusive in-game advertisement placement in a fully automated, almost autonomous way. The platform allows brands to quite literally brand any object, texture, image or video within any game in seconds. It provides immutable and live data tracking to ensure advertisers can really understand how their ads are performing along with the ability to turn on or off ads almost instantly. The company CEO, Pete Mardell recently completed a video demo showcasing the technology fully operational, which has already been used on live campaigns for Dominoes and AXN in Spain. Advertisers are encouraged to sign up to this initial platform at Raidparty.io, while game studios can list their games at the company’s studio site. Although not currently deployed onto a blockchain, the advantages to doing so are clear; Provenance allows advertisers to verify their placement genuinely reached their intended target. Decentralisation provides a higher level of security and ensures the network remains running 24/7. Additionally, the trustless nature of blockchain means advertisers do not need to depend on any third parties for the validity of their advertising spend. Finally, the digital currency can be used to transfer value to the relevant parties that are contractually approved to receive revenue from the game. Other mentionable MVPs that the team has been working on include a games marketplace and a player reward platform that combine to create the foundation of a technology-enhanced games publishing framework. Since the launch of TriForce Tokens, it has been one of the company’s objectives and focuses to secure strong partnerships with organizations within the gaming and technology space. TriForce Tokens uses these partnerships to strengthen its position within the market by utilizing their partnerships resources and community reach. TriForce Tokens also recently acquired part of TheGameWall Studios, a game publishing studio based in Cambridge UK, which has now become TriForce Tokens games publishing arm. This partial acquisition has allowed TriForce Tokens to massively increase its network influence and acquire game publishing agreements with new game releases. Since the launch of RaidParty, TriForce Tokens’ player rewards platform, TriForce Tokens has required some amazing assets in terms of games. With an original focus on mobile games, TriForce Tokens is now collaborating with new PC releases in order to broaden its assets, with the most recent being Eximius: Eximius: Seize The Frontline. A first-person/real time strategy hybrid game that has specifically been built for the e-sports scene, which will be launched September 2018. If you want to get involved in this project and watch it’s growth follow the team on their discord channel, Twitter, and Facebook. The post Dynamic Advertisement On Blockchain? New Release By TriForce Tokens appeared first on Bitcoin PR Buzz.